Background: Costa Rica is a Central American success story: since the late 19th century, only two brief periods of violence have marred its democratic development. Although still a largely agricultural country, it has achieved a relatively high standard of living. Land ownership is widespread. Tourism is a rapidly expanding industry. 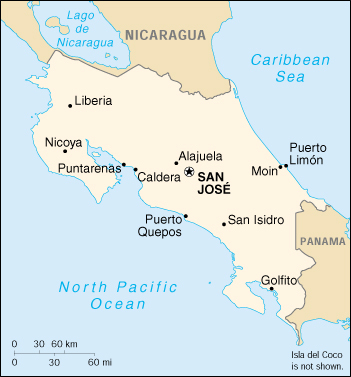 Economy - overview: Costa Rica's basically stable economy depends on tourism, agriculture, and electronics exports. Poverty has been substantially reduced over the past 15 years, and a strong social safety net has been put into place. Foreign investors remain attracted by the country's political stability and high education levels, and tourism continues to bring in foreign exchange. However, traditional export sectors have not kept pace. Low coffee prices and an overabundance of bananas have hurt the agricultural sector. The government continues to grapple with its large deficit and massive internal debt and with the need to modernize the state-owned electricity and telecommunications sector.